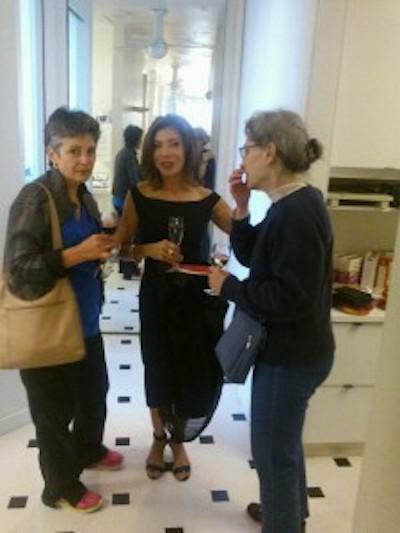 The Aesthetika Open House of Ageless Beauty was a great success. Those who attended were given information on services from beautiful teeth and skin to make up secrets and an opportunity to update their wardrobe with accessories from around the world. Jillian Alderson of Jillian’s Gems offered tips on how to accessorize with simple, affordable jewelry, belts, purses and scarves. She was busy all night as women stopped by exploring her wide array of chick accessories. Dr. Lynn Chiu-Collins, a highly specialized facial plastic surgeon of Union Square Facial Plastic Surgery performed consultations and offered recommendations, both surgical and nonsurgical alternatives such as fillers and Botox, to address the common complaints of fine lines, wrinkles and sagging skin. Dr. Rebecca Castaneda, a cosmetic dentist with a specialty in Prosthodontics carried on many discussions on the topics of teeth whitening, porcelain veneers, dental implants and clear braces for crooked teeth. Dr. Castaneda has been featured as a leading cosmetic dentist in InStyle Magazine, Details Magazine as well as in the local 7X7 Magazine. Chris McDonald was busy applying makeup all the while teaching application techniques for every occasion. Here room was filled to capacity the entire evening.Chris McDonald, a beauty and lifestyle makeup artist was voted one of San Francisco’s best by Allure Magazine. The bubbly, appetizers and conversations continued way into the night, ending in a plethora of raffle gifts. If you left early, you missed an opportunity to win a glamorous gift item. The open house of ageless beauty was a great success. Those who attended were given information on services for beautiful teeth and skin. Here are a couple of our attendees.